Amazon wasn't the first online bookstore, but it grew to be the biggest. I love books. I loved selling books. It's a noble mission, spreading knowledge, promoting education, encouraging reading. It felt great to be growing so fast, doing something I loved and respected. And, in the middle of 1997, Amazon was growing fast. To us software engineers, it seemed almost too fast. When building new systems, we'd often design for x4 current load, only to see x4 current load in just a few months. Often, it felt like it was all we could do to keep the wheels on. But to Jeff, it wasn't fast enough. Jeff saw that Barnes & Noble and other booksellers would come online eventually. Amazon had to be big enough to stand our ground when those giants noticed the upstart challengers and finally turned our way. "Get big fast", Jeff said. And we grew. 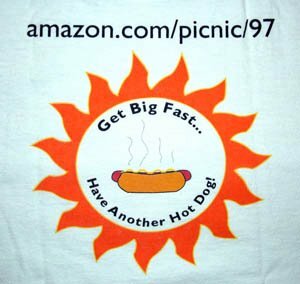 This picture is of the back of the T-shirt from the 1997 Amazon.com summer picnic. Like everything at Amazon, it was a frugal affair. A few kegs out on the lawn. A band made up of Amazon employees (they were good). And, yes, cheap hot dogs. Looking back at those days now, Amazon succeeded beyond our wildest dreams. We had a small online bookstore with hopes of becoming a big bookstore. Amazon is now a superstore, truly a Wal-Mart of the Web, selling books, music, movies, software, electronics, food, hardware, apparel, toys, and more. "Get big fast," Jeff said. And we did. Amazon is huge and a great company, I agree on spreading knowledge. I buy and sell books on Amazon and have to say that Ive been doing well financially due to Amazon. Jeff Bezos keep up the awesome work! It's amazing the foresight he had. I love Amazon! Thanks for all these Amazon stories! I recently joined the company and I enjoy every chance I get to hear how it was like in the early days.